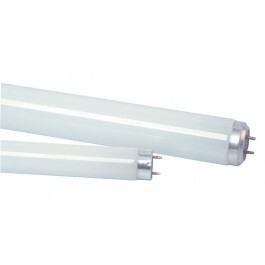 Applications for fluorescent tubes are wide and varied and uses are specific to each lamp. Examples of use are in aquariums, insectocutor units, discotheques, bars, nightclubs, sunbeds, light simulation, undershelf lighting and plant growing. Average Rated Life 9000 Hours. Cap Style: 2 pins 13mm apart. 26mm T12 600mm (5') also available. Also available in 600mm (2'), 1200mm (4') and 1800mm (6'). Full case pack size - 25 Tubes.